Fuel Oil .................................................2906 gallons operational requirements. Class/Survey .......................Maritime New Zealand deadweight during sea trials. DRIVELINE of transporting passengers, freight and vehicles in and around the waters of the Eastern Long Island Sound and Gardiner’s Bay. The ves- sel has an expected delivery date of April 2017. 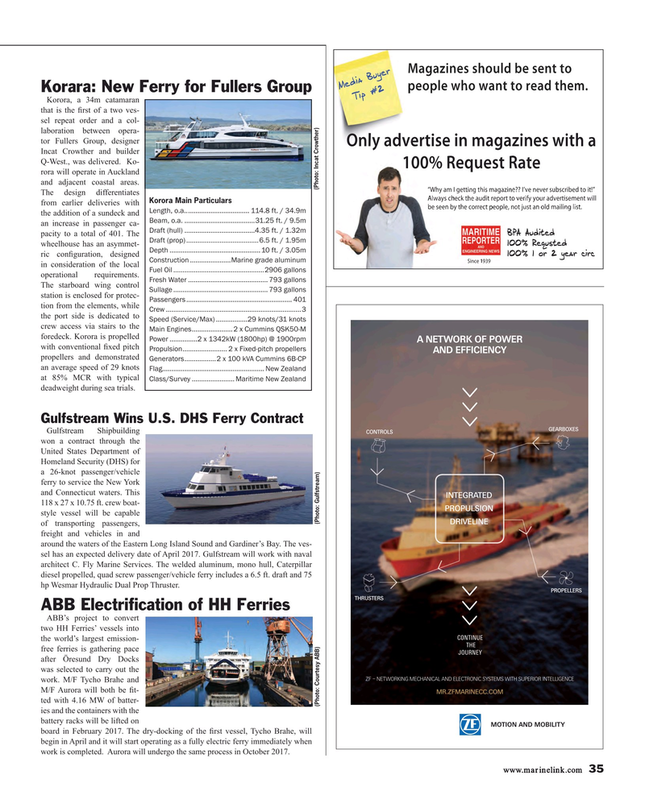 Gulfstream will work with naval architect C. Fly Marine Services. The welded aluminum, mono hull, Caterpillar diesel propelled, quad screw passenger/vehicle ferry includes a 6.5 ft. draft and 75 hp Wesmar Hydraulic Dual Prop Thruster. MR.ZFMARINECC.COM ted with 4.16 MW of batter- (Photo: Courtesy ABB) (Photo: Gulfstream) ies and the containers with the battery racks will be lifted on board in February 2017. The dry-docking of the ? rst vessel, Tycho Brahe, will begin in April and it will start operating as a fully electric ferry immediately when work is completed. Aurora will undergo the same process in October 2017.